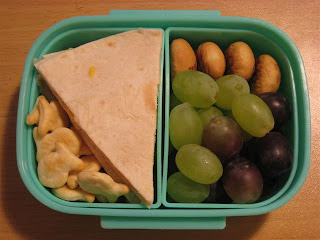 BentoLunch.net - What's for lunch at our house: Last Monday of March! We had Mexican food Monday for the last Monday of March. Really, it's a fancy way of saying I ran out of bread and some other items. ;o) Thankfully, the kiddos like Mexican food and quesadillas are always a hit. 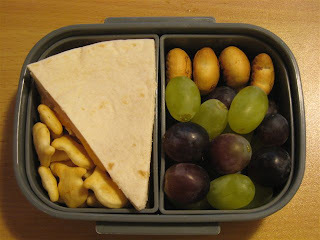 They had matching lunches again--turkey and cheese quesadillas, some parmesan goldfish crackers for filler, purple and green grapes and a few panda cookies for a treat.